← Which Rightline Gear Cargo Carrier is Right For My Minivan? Will The Cargo Saddlebag Work On Crossovers With Sloping Rear Hatches? Some of the newer models of crossovers have rear windows and hatches with a greater slope than that of a minivan or SUV. Our customers have asked if our Cargo Saddlebag will work on these type of vehicles using the roof rack attachment method. After looking at many models of crossover, we settled on the Mazda CX9 as the best example. It has the greatest slope we could find and requires the longest extension of the Cargo Saddlebag side straps. After attaching the straps to the roof rack side rails and adjusting the straps, the Cargo Saddlebag fits perfectly. To attach the straps to a roof rack cross bar, slide the crossbar to its rear most position. Since the Cargo Saddlebag had no trouble fitting the CX9, it will not have any problems fitting on similar sloped-back crossovers. If your vehicle doesn’t have roof rack cross bars or side rails, our Saddlebag Car Clips are a great option. The Clips are added to the Cargo Saddlebag’s side straps and attach to the gap between your vehicle’s roof and rear hatch door. We hope this helps. If you have any questions about the fit of any of our products on your vehicle, please call us at 888.685.GEAR (4327). 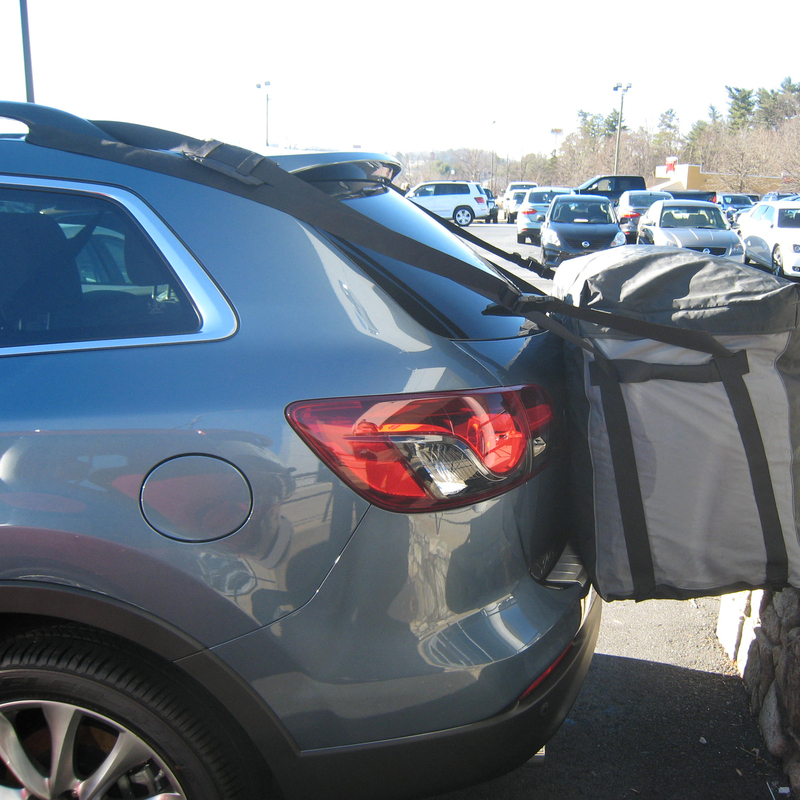 This entry was posted in Cargo Saddlebag Tips and tagged Cargo Saddlebag, car back carrier, crossover, mazda, saddlebag clips. Bookmark the permalink. 2 Responses to Will The Cargo Saddlebag Work On Crossovers With Sloping Rear Hatches? Hi, I am interest to get your saddlebag for my planned Summer trip. I drive a 2013 Toyota Venza with panoramic sunroof(so no rack even possible according to my search) , There is metal part at the roof for the clip to clamp on, But the strips than have to rest on the plastic spoiler, would that be a problem?? Thanks in advance! Hello. We have published a blog article related to using the Saddlebag with vehicles which have a plastic spoiler/fairing here: http://rightlinegear.com/blog/cargo-saddlebag-tips/the-rightline-gear-cargo-saddlebag-and-suv-fairings/ The Saddlebag will mount to your Venza when used with our Saddlebag Car Clips (sold separately). You will want to keep the Saddlebag near its recommended load limit of 100 pounds, position the Saddlebag side strap pads so that they are on the edge of your spoiler/fairing, and possibly check with your vehicle’s manufacturer to determine if there are any known issues with your vehicle. If you have any additional questions please contact us at 888.685.4327.